Who knew the swamp was this deep? 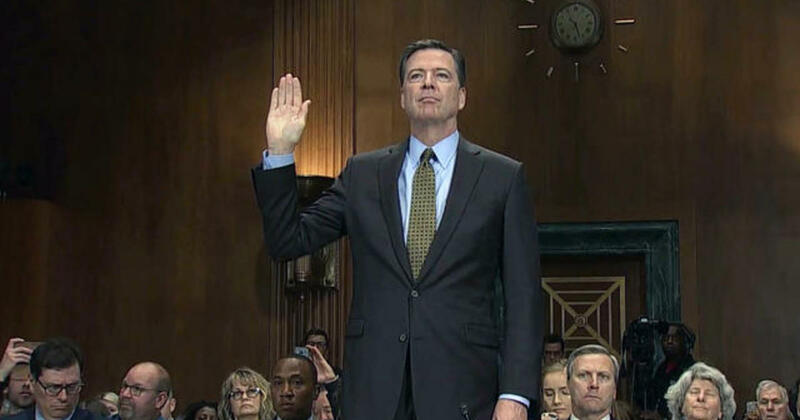 At 6′ 8″ tall, James Comey is going under. It was reported by a whistleblower last year that the NSA was in possession of Hitlery’s deleted emails. With the corruption and lawlessness inside the administration of Barack Hussein, the existence of those emails was kept in the closet like so much other damning information. Now it is being reported that FBI director James Comey was offered those emails by the NSA and he refused them, obviously to keep the likely very incriminating evidence away from the case he was charged with investigating impartially. The swamp gets deeper. Numerous reports coming out of the Senate Judiciary Committee last week said that former FBI Director James Comey made the decision not to refer Clinton for prosecution long before he even interviewed key witnesses, including Hillary. Remember, says the New York Post, the Republicans now control this committee. So bad news isn’t going to be stifled anymore. Clinton, you probably remember, “lost” her private emails, which she’d been storing on a personal computer server. Comey chastised her harshly in a televised speech but then said there was a unanimous decision not to recommend prosecution. Clinton’s emails, which were stolen by the Russians (yuck-yuck), have never been found. But as I’ve mentioned numerous times, the messages are still in the possession of the National Security Agency (NSA), which offered to give them to the FBI. Comey turned down that offer, according to a source who has been very reliable. I’ve also mentioned that Comey fibbed when he said his agents unanimously agreed that prosecution was unnecessary. In fact, my source says that FBI agents were irate about the decision not to go after Clinton. The controversy got pretty intense, which may be why Comey forced agents who worked on the Clinton matter to sign additional nondisclosure agreements. There was another important development last week when a federal judge ordered the FBI to disclose more details about how it handled the Clinton investigation. That could put Comey in a hotter spot than he’s already in. What’s this got to do with the investigation of Trump and any influence the Russians may have had over the last presidential election? Absolutely nothing. But as I’ve said before, any investigation of Trump was likely to backfire when investigators started to look at the Democrats and their dealings. And that’s exactly what is starting to happen.